Thank you Susan and thanks for your support and the support of all the consulate team who have joined us this evening. You may not know this but Susan is a great scholar of history, (goodness what she doesn’t know about the Maoist revolution in Nepal or Iranian politics couldn’t fit on a postage stamp) and of course, in addition, she has an encyclopaedic knowledge of the history of India and deep understanding of the socio-political and economic landscape of this country. Something Susan and I have in common, is that we are both deeply passionate about this country. It is incredibly reassuring to know that Synapse, as an Australian company operating in India, can rely on advice, advocacy and support from the consulate as we work to promote India/Australian trade and contribute to the employment and economic growth of both countries. For those of you who wonder what you are doing here tonight let me briefly introduce Synapse, a wholly owned Australian company operating in India, the UAE, and Australia offering medical administration services around the world. We are the largest medical billing company in Australia and developed the first Australian medical billing app and platform. We offer services such as transcription for doctors and researchers, clinical coding for hospitals and clinics which is how many of these facilities get paid, and now education and training in medical administration. So, tonight we are gathered to launch a new business line of Synapse, The Australian Institute of Medical Administration and Compliance – AIMAC, our foray into online education and training which completes the cycle of services offered by Synapse. We can now not only bill, transcribe and code, we can train administrators to undertake these activities themselves and become independent. Now, some might say we are doing ourselves out of a job. Isn’t it better to keep your clients ignorant about the way your services work? Well that has never been my approach to this business, for me the better educated and independent our clients are as they interact with synapse, the better we are able to serve them and frankly that’s what motivates me, the quality of our services and the empowerment of our clients. You may be interested to know that if you do a bit of googling on how much training there is for the type of work we do – so courses for health insurance administrators, coders, billers, medical record keepers, hospital finance officers and revenue officers, you’ll find there’s almost nothing. Yet, there are over 250 courses on Hospital executive management. That strikes me as odd. Every hospital only has one CEO, but they will have an administrative army that supports the delivery of clinical services, and there is very little out there for them. We knew this to be true because we have never been able to find trained staff ourselves. Before joining Synapse, our Managing Director, Lisa McPherson, was the General Manager of Emirates Airlines health insurance based in Dubai. I remember a conversation with Lisa when she told me that soon after she started in the role and was assessing the skill sets of her team, she informed two of her staff that they needed to learn how to price health insurance products and she was going to send them to a course for this purpose. But there wasn’t one – anywhere in the world. More recently a CEO of an Indian hospital chain commented that high level hospital executives, came highly qualified but poorly skilled, as they had never had any experience or training at the coal face. For those who don’t know, I am close to the end of a PhD on Medicare claiming and compliance, and in July this year, one of the research studies from my doctorate was published in the British Medical Journal. It was a study in which I investigated the question, “who trains Australian doctors in the Australian health system?” and I found that no – one did. Each of the universities, medical colleges and government departments who participated in the study thought someone was doing it but no one was. However, they all agreed that it was very important that whoever was responsible for it should definitely be doing it! And Australia is not alone in this lack of education for doctors, the reason the paper was published in an international journal is that it is an international issue. The BMJ agreed it was an international failing worthy of publication and discussion – how are doctors and patients to understand the health system which serves them if no one teaches it to them. It has always seemed to me so ludicrous that the end users of our health systems, doctors and patients, who actually exchange money for the service have few options to understand the systems that will help them when they get sick. So concerned am I about the lack of knowledge of our system by doctors that I have decided to provide our education module to medical students for free so we can encourage a new generation of Australian doctors to understand and respect the system that supports them. “why doesn’t my private health insurance cover me when I go to the general practitioner”! In addition to the continuing medical education and consumer streams is the registered training organisation. That has taken two years and three people working full time to achieve and it was an incredibly proud moment a few months ago we received notification from the Australian Skills and Quality Authority that we have successfully achieved RTO status. This means we can offer Government accredited courses and we got the nod for all 10 units that we applied for. For locals who may be unaware, this framework is not dissimilar to the NSDC framework in India, offering approved courses in the vocational education and training sector. The way we approached this project was to further develop training modules which we had used to train our own staff. I guess that could be described as an in-house advantage to setting up this training academy, because rather than recruiting people and then spending months and months training them, now they can do our training courses externally first and we will get to offer the best and brightest amongst them, jobs…so you see it’s not all just toil and trouble for us, there was method in our madness! In fact, I expect that about the first 50-100 graduates of AIMAC will all be eligible for jobs at Synapse if that is what they want. Like all businesses, AIMAC cannot exist in a vacuum and so we are already well advanced in forging a number of important partnerships to ensure our education can reach those it is intended to train. I am deep in dialogue with some of the Australian medical colleges, and tonight we will sign our first official MOU with Dr Chinmaya Chigateri from Health Minds Consulting, an infectious disease specialist from Bangalore who operates a very successful continuing medical education company, delivering content across India, the middle east and soon to south east Asia. Chinmaya currently offers clinical course content but has perceived there is a demand for non clinical content, and so it made sense for us to team up and work together. Perhaps most importantly for Indian students is our partnerships with Australian Universities one of which is the University of Technology, Sydney, represented here tonight by Dr Jon Wardle. UTS will offer credit points for our courses to Indian students who can then complete a Bachelor of Health Administration or Masters of Public Health degree at UTS. These pathways to further tertiary study will be of enormous value to Indian students. We also have partners here from Saudi Arabia, the UAE and from other states of India and I am deeply honoured that you all have travelled from so far afield to be with us tonight. Our partners understand the importance of training local staff so that their countries own health systems can operate efficiently and autonomously. This also fits with my dream not just to work in India but with India and millions of cups of chai later we are close! We are building strong relationships with health facilities and medical professionals here in Tamil Nadu, and also in neighbouring Andhra Pradesh, where the state’s own health system is rapidly developing. For me, a complete health system nerd, being involved in any way in bringing universal health coverage to a population of 1.3 billion people in a country that has been so good to me, represents some of the most exciting and important work I have ever done. For India, like Australia, the Kingdom of Saudi Arabia the UAE and every country, governments need to see what they are paying for when it comes to health. The way they do that, is through international clinical coding frameworks. Every country has to have one, there’s only two, the US and ours, and ours is better – no bias there! To prove it, as a doctoral candidate examining this issue, I can state categorically, the most emerging health systems are adopting Australia’s clinical coding framework, in fact 17 countries have adopted it thus far. Our world leading health system is one of Australia’s unsung export heroes and the good news for us at AIMAC is that we have Australia’s clinical coding rock star on our team. To put coding in context, there are 20,000 clinical coders employed just here in Chennai. They are all working using the US framework and working for American healthcare facilities and we are the first working with the Australian framework. We call Anna the Mick Jagger of clinical coding and it is her RTO approved clinical coding course that is one of the 10 modules we will offer. The demand for Anna’s course in many countries is already huge, but most immediately in Saudi Arabia is going to keep her very busy for the foreseeable future. We have also reached agreement with two brilliant pharmaceutical experts here in India. Two women who have written two non-clinical pharmacy courses that they didn’t have a home for. They approached me to see if we would agree to host the courses on our platform – and I said yes. So, this platform is not just for courses we develop, but for as many high quality non-clinical courses as we can find. So finally I want to thank all those who have been involved in getting AIMAC our training academy to this point. 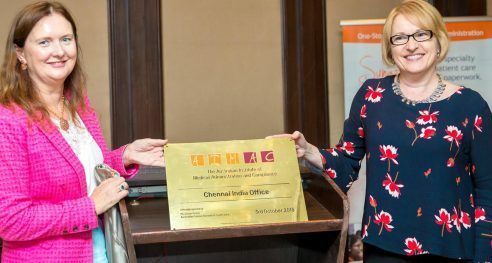 In particular Mahin, our training manager, who has been beavering away developing the training packages in her office in Melbourne and Toby an Australian teacher and educator who has been finessing the products and trialling them here in Chennai – it is a mammoth achievement guys congratulation. So, thank you all for coming to our launch thank you to my friends from Australia who are enjoying the tastes, sounds and general chaotic frenzy of Incredible India. Before I hand you back to Thom, I would just like to announce that today we enrolled our first 7 students in AIMAC!